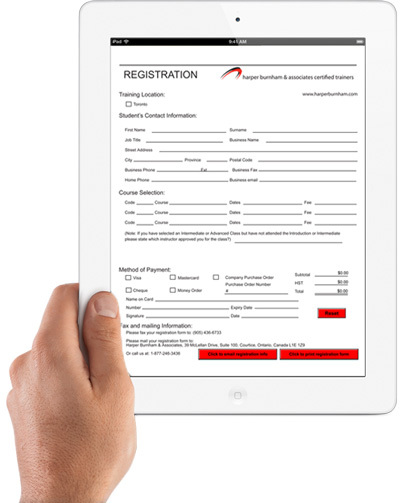 HarperBurnham & Associates provides development and integration services for Adobe e-Forms for corporate work flows. HarperBurnham & Associates develops end user forms that are dynamic and can be used to populate database content or extract content from existing database structures and populate new forms on the fly. We use Adobe Acrobat Pro and Adobe LiveCycle Designer to carry out our development work. email us at info@harperburnham.com and see how we can be of service to you. Form Example below is an Online Registration Form in PDF format. Adobe Certified Training - Why Settle for Less! Adobe Photoshop, InDesign, Captivate, FrameMaker, PreSenter, LiveCycle Designer, Acrobat Connect are registered trademarks of Adobe Systems Incorporated. Storyline registered trademark of Articulate..